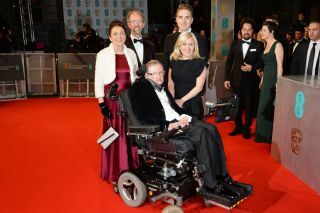 Stephen Hawking with Jane Wilde Hawking Jones (left) and guests attend the EE British Academy Film Awards at the Royal Opera House on Feb. 8, 2015, in London. Jane Hawking, the ex-wife of the late and renowned physicist Stephen Hawking, asserted that "The Theory of Everything," a film about the couple's life and family, got a lot wrong. "Don't ever believe what you see in films," Jane Hawking said this week at the Henley Literary Festival in Oxfordshire, England, while promoting her new book, "Cry to Dream Again" (Alma Books, 2018), as reported by The Guardian. Hawking, whose full name is Jane Beryl Wilde Hawking Jones, said she pleaded with the producers to stick closely to her memoir, but they didn't listen, and keeping the running time to a minimum meant there were inaccuracies. For instance, she said this week that the film glossed over the very real and all-consuming realities of caring for a husband with the incurable neurological disease amyotrophic lateral sclerosis (ALS). Stephen Hawking died on March 14, 2018, at the age of 76. "I'm sorry to say that none of these extensive travels — with all the organizing, packing for a family with a severely disabled member, transporting them, driving them, as well as the usual day-to-day care — really appears in 'The Theory of Everything,'" Jane Hawking said. "I asked for a frenzied fast-forward version — even simply getting all the suitcases, wheelchair and passengers in the car to represent this aspect of our lives — but I was told this was not possible because of the time constraints." And while she and other close confidants may know the true story, the misconceptions and inaccuracies portrayed in the film will remain forever, she suggested. "I knew if there were mistakes in the film that they were going to be immortalized, which they have been," she said, as The Guardian reported. Other inaccuracies and omissions in the film included the place the two first met — it was in St. Albans in Hertfordshire, England, not Cambridge University as the film portrayed — as well as all of the support she received from her parents while she struggled to care for a husband with deteriorating health. These aspects were overlooked in the film, she noted, as reported by the Australian news site news.com.au. Apparently, the film also messed up the dissolution of the couple's marriage. Rather than a beautiful, teary-eyed and mutual breakup, as the film portrays, Jane's book reveals that it was a prolonged crumbling of a partnership that ended in a screaming fight on vacation, The Guardian reported.